With 85% of safety professionals struggling with human factors, you need to go beyond standard procedure. 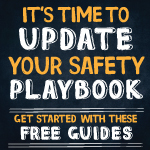 Update your safety playbook using these free guides to tackle human factors that impact PPE noncompliance, distracted driving, back injuries, slips, trips and falls. Download them now!